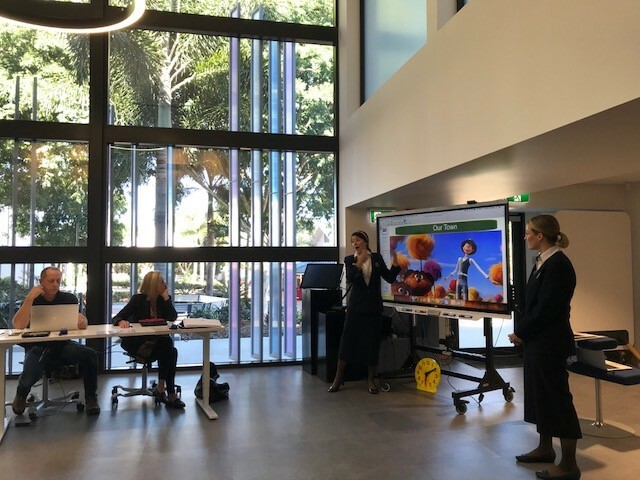 Recently, the SMART ANZ Team held a two-day training event at Sheldon College, Queensland. The College is an outstanding example of careful implementation of technology for learning and innovative practices. Set amongst beautiful grounds, the College has over 1400 students including, an Early Learning Centre and the LINQ Precinct where students learn in industry standard contexts of manufacturing, robotics, 3D Printing, the ability to create digital media products at broadcast quality, using business entrepreneur practices. The primary classrooms are beautifully designed, and students have iPads and the latest SMART Boards in their learning spaces. The College also uses See Saw to communicate with parents and to share classroom practices and students’ learning outcomes. 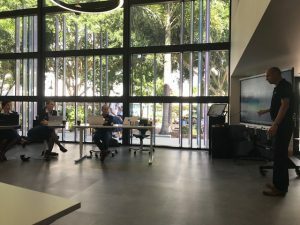 Teachers from across Australia, including Perth and Darwin, joined SMART at Sheldon College who hosted the two-day event. The College has the capacity to host such events and large conferences. 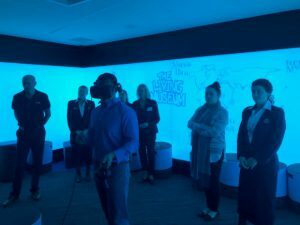 As part of the training days, participants were taken on a tour of the College and provided with a demonstration of how the College uses virtual reality as a way for students to create a range of immersive experiences such as the virtual museum which features their learning pathway through the College. The participants were shown all the latest and greatest from SMART, as well as having to undertake detailed training for each of the SMART Technologies. They were given a global picture of education trends, illustrations of effective use of SMART Technologies, and technical training to understand all the products and services. As a part of their training, the teachers and university lecturers were asked to provide a demonstration of using SMART Technologies for their assessment. All the participants were outstanding but two teachers from Sheldon College, Miss Anita Fitzpatrick and Mrs. Rebecca Woolnough provided a detailed presentation of how they had differentiated the curriculum immediately in response to assessing student understanding, and how they had dramatically seen improved learning outcomes using the SMART Learning Suite Online. Mrs. Rebecca Woolnough demonstrated to us how, as a Digital Coach within the College, she has found the mobility of the SMART Learning Suite Online an enabling tool for working within and across classes. Mrs Woolnough was able to walk into any classroom and share her units of work with any teacher. A unit of work that she had developed on time for her students illustrated to her the benefits of the software in linking the learning ecosystem in their classrooms and how to effectively differentiate the curriculum. Using SMART Response, Mrs. Woolnough was able to assess her students’ understanding of digital and analogue time and immediately group them accordingly. Once she had grouped the students, Mrs. Woolnough was able to differentiate the curriculum for them and push different activities to their iPads which were appropriate for their learning needs. She evaluated the capability of the software and the speed in which she could gather data about her students understanding of these concepts as transforming. In terms of the SAMR model, the SMART Learning Suite on line enabled her to transform her practice. ganised her students into small groups using the class.lab software to push content to their iPads. The students worked in three teams enhancing the quality of their narrative orientations. As they shared these to the SMART Board, the three teams could transparently see how the other teams were using more complex, accurate, descriptive words and quickly applied them or added them to their own sentences quickly learning from each other. They had three rotations of this process and Miss Fitzpatrick said the improvements in their syntax and semantic choices were immediately visible. Using the screenshot function of their iPads, the students then sent their narrative orientations using their Seesaw accounts and shared this work with their parents. During this group activity, Miss Fitzpatrick was able to mentor teams, assist with clarification of word meanings, and view the rapid development of their writing. The speed and efficiency with which this occurred was surprising. In a pen and paper world, the same activity would have taken weeks. The students would have laboriously written sentences that she would have had to correct most probably at home and then return for them to rewrite and improve. The time between the assessment and the set task often disconnected the learner from the learning purpose. Miss Fitzpatrick would also have been the single source for the editing. However, with the digital task, all students were reading the sentences and collaborating to improve the work, thereby understanding how descriptive words were making their introductions richer. Finally, in order to inform parents of the work the students were doing in a pen and paper world, would have also taken far more time. We were indeed privileged to see these outstanding examples of classroom practice and to spend two days at Sheldon College!